Goes directly on the fire or grill and gives delicious smoke flavor to every bite, without burning. Humans were cooking with clay pots on the fire over 20,000 years ago. Despite all the different materials available today, clay is still hot as a kiln, because it looks good and cooks even better. 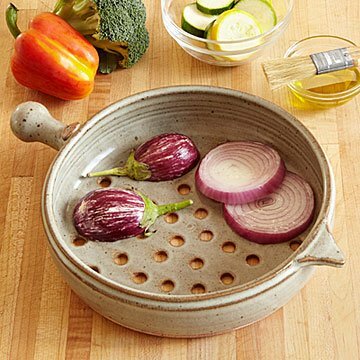 The even, gentle heat this grill basket provides preserves food's deliciousness, and the 44 holes in the bottom allow the heat to add its flavor magic evenly, with no burned spots. Morgan Baum makes these from special high-fired clay that can withstand the direct heat of a burner or fire. A small bulb handle and tab make it easy to hold the pan while cooking, but won't take up valuable grill space, and the beautiful gray glaze makes cleanup easy. Only a few potteries make this kind of cookware. Grilling enthusiasts, slow foodies, and fans of handmade ceramics will swoon over this very special piece of cookware. Handmade in Hutchinson, Minnesota. Morgan Baum's family has been creating unique, affordable, functional pottery on a 54-acre hobby farm in Hutchinson, Minnesota for decades. As a kid, she earned her allowance working in the studio and spent many summer weekends at art shows across the Midwest. Morgan has a background in fundraising, journalism, advocacy, and art. She puts all of her passions to work each day. Since taking over the family business she has been raising awareness and advocating for handcrafted arts in her community. Her writing has been featured in Ceramics Monthly. In 2016, Morgan added an Emerging Artist Incubator space in her studio for young artists to learn more about running a small business and to help grow the next generation of Minnesota studio potters. 10.25" diameter x 2.5" H (14.5" L with handle); 3.12 lbs.